Northrop Grumman, Redondo Beach, Calif.
WASHINGTON -- Mirrors are a critical part of a telescope. The quality is crucial, so completion of mirror polishing represents a major milestone. All of the mirrors that will fly aboard NASA's James Webb Space Telescope have been polished so the observatory can see objects as far away as the first galaxies in the universe. The Webb telescope is comprised of four types of mirrors. The primary one has an area of approximately 25 square meters (29.9 square yards), which will enable scientists to capture light from faint, distant objects in the universe faster than any previous space observatory. The mirrors are made of Beryllium and will work together to relay images of the sky to the telescope's science cameras. "Webb's mirror polishing always was considered the most challenging and important technological milestone in the manufacture of the telescope, so this is a hugely significant accomplishment," said Lee Feinberg, Webb Optical Telescope manager at NASA's Goddard Space Flight Center in Greenbelt, Md. The mirrors were polished at the L3 Integrated Optical Systems - Tinsley in Richmond, Calif. to accuracies of less than one millionth of an inch. That accuracy is important for forming the sharpest images when the mirrors cool to -400°F (-240°C) in the cold of space. "The completion of the mirror polishing shows that the strategy of doing the hardest things first has really paid off," said Nobel Prize Winner John C. Mather, Webb's senior project scientist at Goddard. "Some astronomers doubted we could make these mirrors." After polishing, the mirrors are being coated with a microscopically thin layer of gold to enable them to efficiently reflect infrared light. NASA has completed coating 13 of 18 primary mirror segments and will complete the rest by early next year. The 18 segments fit together to make one large mirror 21.3 feet (6.5 meters) across. "This milestone is the culmination of a decade-long process," said Scott Willoughby, vice president and Webb Telescope Program manager for Northrop Grumman Aerospace Systems. "We had to invent an entire new mirror technology to give Webb the ability to see back in time." Northrop Grumman Corp. in Redondo Beach, Calif. is the telescope's prime contractor. As the successor to the Hubble Space Telescope, the Webb telescope is the world's next-generation space observatory. It is the most powerful space telescope ever built. More than 75 percent of its hardware is either in production or undergoing testing. The telescope will observe the most distant objects in the universe, provide images of the first galaxies ever formed and study planets around distant stars. NASA, the European Space Agency and the Canadian Space Agency are collaborating on this project. For related images and more information about the mirrors, visit http://www.nasa.gov/topics/universe/features/webb-mirrors-done.html. To view the "Behind the Webb: Wax on, Wax Off" video explaining the mirror polishing process, visit http://webbtelescope.org/webb_telescope/behind_the_webb/10. For more information about the James Webb Space Telescope, visit http://www.jwst.nasa.gov. PEARL HARBOR (NNS) -- Pearl Harbor Naval Shipyard and Intermediate Maintenance Facility (PHNSY & IMF) completed installation of a $1.7 million photovoltaic (PV) system, June 1. The new system is anticipated to reduce the facility's electric bill by $89,000 per year. Nearly 1,300 solar panels were installed on the rooftop of Building 167, generating at least 250 kilowatts of power during peak daylight hours, or more than 455,000 kilowatt hours of energy annually. "Hawaii depends on petroleum for nearly 90 percent of its energy requirements," said Shipyard Commander Capt. Brian Osgood. "This photovoltaic system uses the power of the sun as a long-term source of environmentally clean, renewable energy. It's another step toward making the shipyard and the Navy less dependent on oil." PHNSY & IMF Other Procurement, Navy, Program/Project Manager Tiffany Nekota said the PV system has a life of more than 25 years and will maintain a minimum of 80 percent of its peak output even at the end of the system's lifespan. Nekota said the new system is "grid-tied," meaning power generated by the system feeds into the building's existing electrical system. A weather station, DC-to-AC power conversion, monitoring, safety, interlock and shut-off capabilities are all part of the system. About 20,000 square feet of rooftop are covered with solar panels, but pedestrians at ground level will barely notice the change. "One of the considerations in the design was to preserve the historical nature of the building," Nekota said. PHNSY & IMF Energy Conservation Manager Fred Nelson said the PV project helps the shipyard support secretary of the Navy's goal to have at least half of shore-based energy come from alternate sources; and helps meet federal regulations requiring agencies to reduce per-square-foot energy consumption in buildings by 3 percent per year. PHNSY & IMF, one of four naval shipyards, is a full-service naval shipyard and regional maintenance center for the Navy's surface ships and submarines. It is a field activity of the Naval Sea Systems Command that engineers, builds, buys and maintains naval ships, submarines and their combat systems. Strategically located in the mid-Pacific, PHNSY & IMF is about a week of steam time closer to potential major regional contingencies in East Asia than sites on the West Coast. WASHINGTON, June 30, 2011 – The Defense Department’s overseas medical research laboratories will play a key role in ensuring the readiness of deployed U.S. military forces well into the future, while also contributing to global health and U.S. partnership-building around the world, the Pentagon’s senior health affairs advisor said. These labs include the U.S. Army Medical Research Unit in Nairobi, Kenya; the Armed Forces Research Institute of Medical Sciences in Bangkok; the U.S. Naval Medical Research Unit 3 in Cairo; NAMRU-6 in Lima, Peru; and NAMRU-2 Pacific, temporarily headquartered at Pearl Harbor, Hawaii. A sixth laboratory, U.S. Army Medical Research Unit Europe, in Heidelberg, Germany, conducts psycho-social research; and the precursor to a new U.S. Army laboratory, the Central Public Health Reference Library, opened in March in Tbilisi, Georgia. Woodson echoed the CSIS report’s finding that the laboratories, while “exceptional” in their contribution to military readiness as well as scientific research and global health, are “surprisingly under-recognized and undervalued” outside the research community. The CSIS report noted some of the labs’ contributions: the first vaccine for Japanese encephalitis virus; the first isolation of the Rift Valley Fever virus; the first identification of new strains of dengue fever in Peru; the demonstrated efficacy of several drugs to treat and prevent malaria; and in Thailand, the first successful HIV/AIDS vaccine trial, among them. Woodson cited the research laboratories’ long history of addressing disease that rendered troops ineffective, with decades of work that helped develop a robust inventory of vaccines and therapeutics. The laboratories’ achievements have extended far beyond the military, helping to reduce human suffering and promoting stability around the world, Woodson said. “Building healthy populations is a worthy strategic engagement approach,” he said. “In fact, utilizing medicine and building healthy populations is a way of preserving the peace so we don’t have to get into these kinetic wars” and can focus on building stable societies. Woodson emphasized the importance of partnerships in advances made to date and called for closer collaboration in the future: between government agencies, government, academia and the private sector, and the world health community. He paid tribute to the professionals who work largely behind the scenes to advance the labs’ work. Woodson emphasized the importance of strategic communication that helps build broader understanding and appreciation for the laboratories’ contributions to global health. This will be particularly important during times of budget constraints, when cost-sharing will become increasingly important, he said. The laboratories have roots dating back to the 19th century, the CSIS report noted. The Walter Reed Army Institute of Research, which oversees the Army’s international network of laboratories, traces its institutional heritage to the Army Medical School, founded in 1893 by U.S. Army Surgeon General Brig. Gen. George Miller Sternberg. Sternberg established the Army’s first two overseas laboratories in Cuba and the Philippines to investigate outbreaks of typhoid fever and yellow fever that were undermining U.S. military efforts during the Spanish-American War. The Navy established its first domestic naval medical laboratory in 1953 on the grounds of the Brooklyn Naval Hospital in 1983. WASHINGTON -- Galaxies once thought of as voracious tigers are more like grazing cows, according to a new study using NASA's Spitzer Space Telescope. Astronomers have discovered that galaxies in the distant universe continuously ingested their star-making fuel over long periods of time. This goes against previous theories that galaxies devoured their fuel in quick bursts after run-ins with other galaxies. "Our study shows the merging of massive galaxies was not the dominant method of galaxy growth in the distant universe," said Ranga-Ram Chary of NASA's Spitzer Science Center at the California Institute of Technology in Pasadena, Calif. "We're finding this type of galactic cannibalism was rare. Instead, we are seeing evidence for a mechanism of galaxy growth in which a typical galaxy fed itself through a steady stream of gas, making stars at a much faster rate than previously thought." Chary is the principal investigator of the research appearing in the Aug. 1 issue of the Astrophysical Journal. According to his findings, these grazing galaxies fed steadily over periods of hundreds of millions of years and created an unusual amount of plump stars, up to 100 times the mass of our sun. "This is the first time that we have identified galaxies that supersize themselves by grazing," said Hyunjin Shim, also of the Spitzer Science Center and lead author of the paper. "They have many more massive stars than our Milky Way galaxy." Galaxies like our Milky Way are giant collections of stars, gas and dust. They grow in size by feeding off gas and converting it to new stars. A long-standing question in astronomy is: Where did distant galaxies that formed billions of years ago acquire this stellar fuel? The most favored theory was that galaxies grew by merging with other galaxies, feeding off gas stirred up in the collisions. Chary and his team addressed this question by using Spitzer to survey more than 70 remote galaxies that existed 1 to 2 billion years after the big bang (our universe is approximately 13.7 billion years old). To the surprise of the astronomers, these galaxies were blazing with what is called H alpha, radiation from hydrogen gas that has been hit with ultraviolet light from stars. High levels of H alpha indicate stars are forming vigorously. Seventy percent of the surveyed galaxies show strong signs of H alpha. By contrast, only 0.1 percent of galaxies in our local universe possess the signature. Previous studies using ultraviolet-light telescopes found about six times less star formation than Spitzer, which sees infrared light. Scientists think this may be due to large amounts of obscuring dust, through which infrared light can sneak. Spitzer opened a new window onto the galaxies by taking very long-exposure infrared images of a patch of sky called the GOODS fields, for Great Observatories Origins Deep Survey. NASA's Jet Propulsion Laboratory in Pasadena manages the Spitzer Space Telescope mission for the agency's Science Mission Directorate in Washington. Science operations are conducted at the Spitzer Science Center. Caltech manages JPL for NASA. For more information about Spitzer, visit http://www.nasa.gov/spitzer. It's what Bill Patzert, a climatologist and oceanographer at NASA's Jet Propulsion Laboratory in Pasadena, Calif., likes to call a "La Nada" – that puzzling period between cycles of the El Niño-Southern Oscillation climate pattern in the Pacific Ocean when sea surface heights in the equatorial Pacific are near average. The comings and goings of El Niño and La Niña are part of a long-term, evolving state of global climate, for which measurements of sea surface height are a key indicator. For the past three months, since last year's strong La Niña event dissipated, data collected by the U.S.-French Ocean Surface Topography Mission (OSTM)/Jason-2 oceanography satellite have shown that the equatorial Pacific sea surface heights have been stable and near average. Elsewhere, however, the northeastern Pacific Ocean remains quite cool, with sea levels much lower than normal. The presence of cool ocean waters off the U.S. West Coast has also been a factor in this year's cool and foggy spring there. The current state of the Pacific is shown in this OSTM/Jason-2 image, based on the average of 10 days of data centered on June 18, 2011. The image depicts places where Pacific sea surface height is higher (warmer) than normal as yellow and red, while places where the sea surface is lower (cooler) than normal are shown in blue and purple. Green indicates near-normal conditions. Sea surface height is an indicator of how much of the sun's heat is stored in the upper ocean. For oceanographers and climate scientists like Patzert, "La Nada" conditions can bring with them a high degree of uncertainty. While some forecasters (targeting the next couple of seasons) have suggested La Nada will bring about "normal" weather conditions, Patzert cautions previous protracted La Nadas have often delivered unruly jet stream patterns and wild weather swings. In addition, some climatologists are pondering whether a warm El Niño pattern (which often follows La Niña) may be lurking over the horizon. Patzert says that would be perfectly fine for the United States. 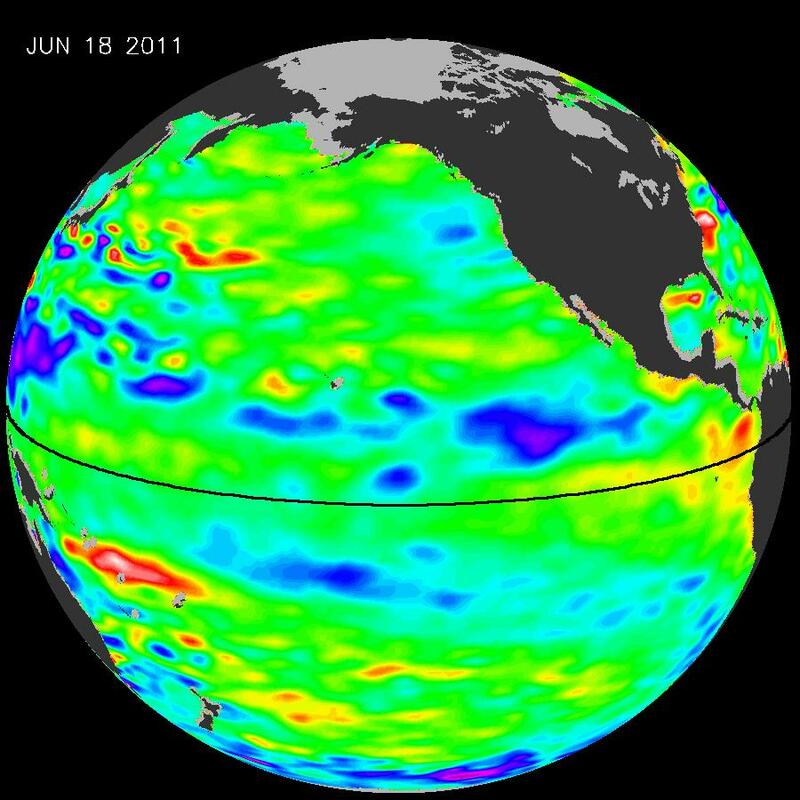 "For the United States, there would be some positives to the appearance of El Niño this summer," Patzert said. "The parched and fire-ravaged southern tier of the country would certainly benefit from a good El Niño soaking. Looking ahead to late August and September, El Niño would also tend to dampen the 2011 hurricane season in the United States. We've had enough wild and punishing weather this year. Relief from the drought across the southern United States and a mild hurricane season would be very welcome." Jason-2 scientists will continue to monitor Pacific Ocean sea surface heights for signs of El Niño, La Niña or prolonged neutral conditions. JPL manages the U.S. portion of the OSTM/Jason-2 mission for NASA's Science Mission Directorate, Washington, D.C.
For more information on NASA's ocean surface topography missions, visit: http://sealevel.jpl.nasa.gov/missions/. To view the latest Jason-1 and OSTM/Jason-2 data, visit http://sealevel.jpl.nasa.gov/science/elninopdo/latestdata/. Preparations at NASA's Kennedy Space Center in Florida are moving forward as space shuttle Atlantis' liftoff on July 8 nears. Today, technicians at Launch Pad 39A will pressurize Atlantis' main propulsion system following the closure yesterday of the spacecraft's payload bay doors. The STS-135 crew will participate in preflight interviews from NASA's Johnson Space Center today. Briefings about this final mission of the Space Shuttle Program will air live on NASA TV throughout the day and also can be seen online at nasa.gov/ntv. On June 10, 2011, NASA's Lunar Reconnaissance Orbiter angled its orbit 65° to the west, allowing the spacecraft's cameras to capture a dramatic sunrise view of the moon's Tycho crater. A very popular target with amateur astronomers, Tycho is located at 43.37°S, 348.68°E, and is about 51 miles (82 km) in diameter. The summit of the central peak is 1.24 miles (2 km) above the crater floor. The distance from Tycho's floor to its rim is about 2.92 miles (4.7 km). 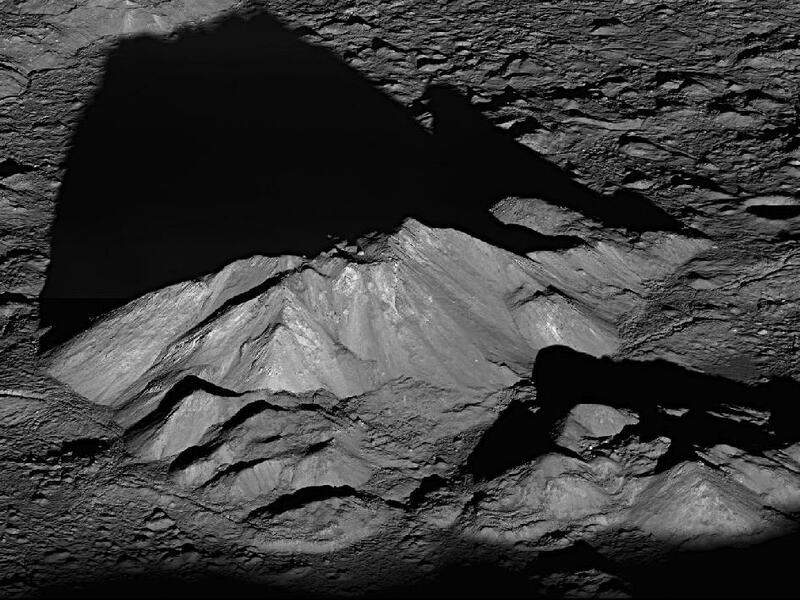 Tycho crater's central peak complex, shown here, is about 9.3 miles (15 km) wide, left to right (southeast to northwest in this view). CAMP LEATHERNECK, Afghanistan, June 30, 2011 – Every Marine has a story. For one reservist serving in Afghanistan’s Helmand province, the story is of a rocket scientist who answered the call to serve his country as a third-generation Marine. Marine Corps 1st Lt. William J. Fredericks, a 29-year-old from Nantucket, Mass., works as an aerospace engineer at NASA Langley Research Center in Hampton, Va. He graduated from Purdue University in 2006 with a degree in aeronautical engineering, and moved to Williamsburg, Va., after landing the position with NASA. While he enjoys the challenge of his prestigious career, sitting at a desk in the aeronautics systems analysis branch was not quite enough. That upbringing included a military heritage. Fredericks’ father and grandfather both served as Marines as well, a legacy that now spans three generations. Fredericks’ father signed his son’s commissioning papers and administered the oath of office, a moment he considers the greatest honor of his life. His wife held the Bible for their son as he repeated the oath, swearing to support and defend his country. The 2008 commissioning was followed by a celebratory dinner in which the retired major handed down to his son his Mameluke sword, the ceremonial sword carried exclusively by Marine officers. “Recognizing the importance of the moment, it now represents one of the most valuable family possessions,” Fredericks’ father said. The Marine Corps tradition began with Fredericks’ grandfather, Wesley Fredericks, a World War II veteran who fought in five island campaigns in the Pacific theater as a combat engineer with the 1st Marine Division. He passed away while his grandson was still young, and rarely spoke to his son about the war. The few stories he did share were of starvation at Guadalcanal, and savage fighting in the battles for Sugarloaf Hill and Shuri Castle on Okinawa. Wesley Fredericks was there as the Marines fought their way up Sugarloaf Hill 13 times before finally holding it. As a combat engineer, he often had to climb hills where the Japanese had dug their maze of entrenchments and use rope to swing dynamite satchels into caves, blasting the enemy from their positions. After the war, Wesley Fredericks left the Marine Corps as a staff sergeant and returned to his pre-war career as a plumber in New York City. But the war veteran became proud of his son’s decision over time. More than 60 years later the family service continues, with the youngest Fredericks now serving as an artillery officer with Kilo Battery, 2nd Battalion, 14th Marine Regiment -- a high-mobility artillery rocket system battery operating in Regional Command Southwest in Afghanistan. “My Dad thought I should have joined the Air Force,” Fredericks said, explaining they had research positions similar to his job at NASA. Yet, he chose a combat arms specialty in the Marine Corps with “pretty much zero” similarities to his desk job. As a reservist, Fredericks belongs to Hotel Battery, 3rd Battalion, 14th Marine Regiment, an M777 155 mm howitzer battery based in Richmond, Va. Their sister battalion, 2/14, needed more lieutenants for their deployment, and Fredericks answered that call. He arrived in Afghanistan in mid-January and is scheduled to return home and pick up where he left off at NASA sometime late this summer. Besides their military service, the Fredericks also share an interest in sailing and sailboat racing. Fredericks spent 10 months between high school and college sailing around the world on a 188-foot-long ship, visiting almost 40 different ports of call. Still, their Marine Corps heritage remains their strongest tie. Technology Today's June 30th Radio Show Addresses Health IT.Wonder-Cure or Expensive Placebo? It’s an industry being positioned as everything from the next great frontier of job creation to the innovations capable of revolutionizing how medicine is delivered in American while dramatically cutting its costs. The desire to create meaningful use of health data, to empower providers, physicians and others to provide better care while simultaneously, lowering costs is a goal that will take years to achieve. This week, we look at the current state of Health IT in America and compare the industry and our current practices to those of European nations which are often used as models for our own reforms. Technology Today is the #1 rated technology talk show on Internet radio for a rapidly growing worldwide audience of people who are curious about technology and who need an interactive information channel that can help them make sense of how innovations in business and personal technologies are shaping our lives. This week’s show will discuss, in-depth, the opportunities and challenges the United States faces in implementing integrated electronic health records (EHRs), a nation-wide data exchange network and improve over-all patient care. We’ll be joined by Hans Agarwal, Practice Leader at Everis, a multi-national consulting firm operating on both sides of the Atlantic. We will examine the current state of health IT and discuss who is leading the way, what is working and what European models can the United States adopt to improve our current status in health IT. Don’t forget -- Technology Today is now on the BlogTalkRadio network – the online home for Internet Radio! WHAT: Technology Today Radio Show – Healthcare IT…Wonder-Cure or Expensive Placebo? 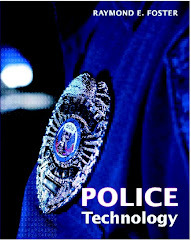 WHERE: Technology Today continues to air on Thursdays at 4PM on http://www.blogtalkradio.com/technologytoday. You can still reach us by phone, email, texts to 240-731-0756, facebook, and on Twitter. Our new call-in number is (323) 410-0032. Please visit www.technologytodayradio.com. Technology Today is the #1 rated technology talk show on Internet radio for a rapidly growing worldwide audience of people who are curious about technology and who need an interactive information channel that can help them make sense of how innovations in business and personal technologies are shaping our lives. Created and hosted by cybersecurity authority Ajay Gupta, Technology Today also offers tech-driven sponsors an uncommon branding platform that delivers precision-targeted messages to a self-selected, self-perpetuating community of predisposed enthusiasts who are open to innovation and, therefore, new ways of thinking and doing. Unlike traditional talk radio programs, Technology Today creates an online community in which listeners, guests and sponsors can come to know the issues, people and organizations driving development and deployment of technologies that are changing lives and shaping the future. Technology Today air Live on Thursdays at 4pm Eastern Standard Time. For more information on Technology Today please visit www.technologytodayradio.com or follow the show through Facebook, Twitter or the show's blog. GREENBELT, Md. -- NASA awarded a follow-on contract to Lockheed Martin Space Systems Corporation (LMSSC) for Mission Operations, Systems Engineering and Software (MOSES-II) for the Hubble Space Telescope. This is a five-year cost-plus-award fee sole source contract with LMSSC with a value of $133,070,796, which includes the maximum award fee. Under this contract, LMSSC will continue to maintain Hubble's health and safety through the next phase of its science mission. The scope of this effort includes all elements of operations other than science operations, and systems engineering tasks required to maintain Hubble flight and ground systems. Mission operations responsibilities include safe and efficient control and utilization of Hubble, maintenance and operation of its facilities and equipment, as well as creation, maintenance, and utilization of Hubble operations processes and procedures. Critical systems engineering responsibilities consist of optimizing mission system capabilities to ensure Hubble operations are effective to continue scientific results. For more information about Hubble, visit http://www.nasa.gov/hubble. WASHINGTON -- The final launch of the space shuttle program is scheduled for 11:26 a.m. EDT on July 8, and NASA has invited 150 followers of the agency's Twitter account to be there. People selected will have a behind-the-scenes perspective from the press site at the agency's Kennedy Space Center in Florida. NASA randomly selected the participants from more than 5,500 online registrants during a 24-hour opportunity on June 1-2. Attendees represent 44 U.S. states, the District of Columbia, Australia, Canada, France, Germany, Ireland, Japan, Mexico, Netherlands, Spain, Switzerland and the U.K.
Tweetup participants are coming from Alaska, Arizona, Arkansas, California, Colorado, Connecticut, Florida, Georgia, Hawaii, Idaho, Illinois, Indiana, Iowa, Kansas, Kentucky, Louisiana, Maine, Maryland, Massachusetts, Michigan, Minnesota, Mississippi, Missouri, Montana, Nebraska, Nevada, New Hampshire, New Jersey, New Mexico, New York, North Carolina, Ohio, Oklahoma, Oregon, Pennsylvania, Rhode Island, South Dakota, Tennessee, Texas, Utah, Virginia, Washington, West Virginia and Wisconsin. They will share their experiences with their more than 1.5 million combined followers through the social networking site Twitter. Beginning at 10:30 a.m. on July 7, NASA will broadcast a portion of the Tweetup when participants get to talk with Bill Gerstenmaier, associate administrator for Space Operations, astronaut Mike Massimino and Angie Brewer, space shuttle Atlantis' flow director at Kennedy. Joining them will be a special celebrity guest, Sesame Street's Elmo. Sesame Street will be at Kennedy to film Elmo, as he learns about space exploration at NASA. To watch the broadcast, visit http://www.ustream.tv/channel/nasatelevision. Participants also will tour Kennedy; make an up close visit to the launch pad, and wave at Atlantis' crew members on their drive to the launch pad. The Tweetup culminates with the shuttle's lift off. Reporters credentialed to cover the launch also may cover the NASA Tweetup at Kennedy's press site. Reporters interested in interviewing Tweetup attendees in advance should contact Stephanie Schierholz at 202-358-1100 or stephanie.schierholz@nasa.gov. This is the fifth time NASA has invited Twitter followers to experience a space shuttle launch. Previously, groups attended lift offs of Atlantis' STS-129 and STS-132 missions, Discovery's STS-133 mission, and Endeavour's STS-134 mission. To follow the Tweetup participants on Twitter, as they experience the prelaunch events and shuttle liftoff, follow the #NASATweetup hashtag and the list of attendees at http://twitter.com/nasatweetup/sts-135-launch. All four of Atlantis' crew members are posting updates to Twitter. You can follow Commander Chris Ferguson, Pilot Doug Hurley, and Mission Specialists Sandy Magnus and Rex Walheim at http://www.twitter.com/Astro_Ferg , http://www.twitter.com/Astro_Doug , http://www.twitter.com/Astro_Sandy , and http://www.twitter.com/Astro_Rex. To connect with NASA on Twitter and other social networking sites, visit http://www.nasa.gov/connect. For more information about space shuttle Atlantis' STS-135 mission, visit http://www.nasa.gov/shuttle. CLEVELAND -- NASA has selected Alphaport Inc. of Cleveland to provide technical support services to the NASA Safety Center. The type of services to be provided include training course development and support; mishap investigation training, reporting and office support; information dissemination and outreach; technical writing and graphics design; system failure case studies development; agency-wide safety and mission assurance conference support; operational support of the Safety Center’s information technology systems; change control and knowledge management; engineering services; NASA Incident Reporting Information System data quality, analysis, trending, and special studies; and project management. The services will be provided primarily at the NASA Safety Center in Cleveland. The cost-plus-fixed-fee, indefinite-delivery/indefinite-quantity contract has a period of performance of five years with a potential value of $28.5 million. The NASA Safety Center supports the safety and mission assurance requirements of NASA's portfolio of programs and projects. The center reports to the Office of Safety and Mission Assurance at NASA Headquarters in Washington. For information about the NASA Safety Center, visit http://www.nasa.gov/offices/nsc/home. SAN DIEGO (NNS) -- Members of the California Energy Commission toured shore facilities in Navy Region Southwest, June 27, in an effort to strengthen commitments and ties with the Navy regarding renewable, green energies. The group toured facilities onboard Naval Base Coronado, and Naval Amphibious base Coronado. Energy efficient commodities such as solar powered street lamps and training classrooms that use green energy were a few of the main draws. "Today was an opportunity to have some people from the California energy commission come and visit the Navy and discuss energy efficiency and renewable energy opportunities in the state of California and an opportunity to show up close the Navy's projects and installations," said Bernie Lindsey, Navy Region Southwest utilities & energy program manager. Of interest to the group were the Navy's photovoltaic systems that convert heat from the sun into electricity, solar panels located on top of streetlights and long-term parking. "We wanted to see the Navy's energy facilities and its commitment to renewable and energy efficiency and look for ways we can work together on that," said Dr. Robert Weisenmiller, California Energy Commission chair. "What was most impressive was the Navy's dedication on trying to get the energy use down and the renewable energy production up." The Navy and the state of California have been working together for many years to help develop and implement green technologies throughout its shore facilities within the state. "Some of the stuff we've seen so far resulted form the partnership we have," said Weisenmiller. "We do a lot of research and development and we need someplace to test those products and this is a good opportunity down here." As the Navy continues to implement renewable energy in its existing facilities, it is also looking into the future as new projects begin construction. "Their (California Energy Commission's) interest across the state is improving energy efficiency in existing buildings and helping insure that new buildings that get constructed are the most energy efficient possible," said Lindsey. "They are also very interested and involved in renewable energy development across the state of California. And so all of those issues and objectives that they have are very compatible with the Navy's requirements, goals and objective." Both the state of California and the Navy have been very dedicated to integrating renewable energy systems wherever it is possible. Many existing programs and utilities were developed in California. "Our goals and objectives are very similar, one of their (California Energy Commission's) objectives is to facilitate and promote California companies that make technologies to improve energy efficiency," said Lindsey. "One of their main goals is to help get California technologies more prominently to the market, so they see the Navy as obviously a large, potential customer that needs a lot of energy efficient technologies.". Because of their similar interest in renewable energy technologies, the partnership between the Navy and the state of California is one that will continue to grow stronger as both parties strive to alleviate dependency on less efficient energy sources. "I think the major thing is that we both have the same goals to get much more secure energy system by using energy wisely and also using green energy," said Weisenmiller. "They're greening the Navy, I'm trying to green the state." The Navy is partnering with state agencies around the country to reduce its energy usage and increase its renewable and green energy production, both at sea and at shore-based facilities. Two different NASA satellites provided valuable information about the hundreds of thunderstorms that make up Tropical Storm Arlene as it nears landfall in northeastern Mexico. 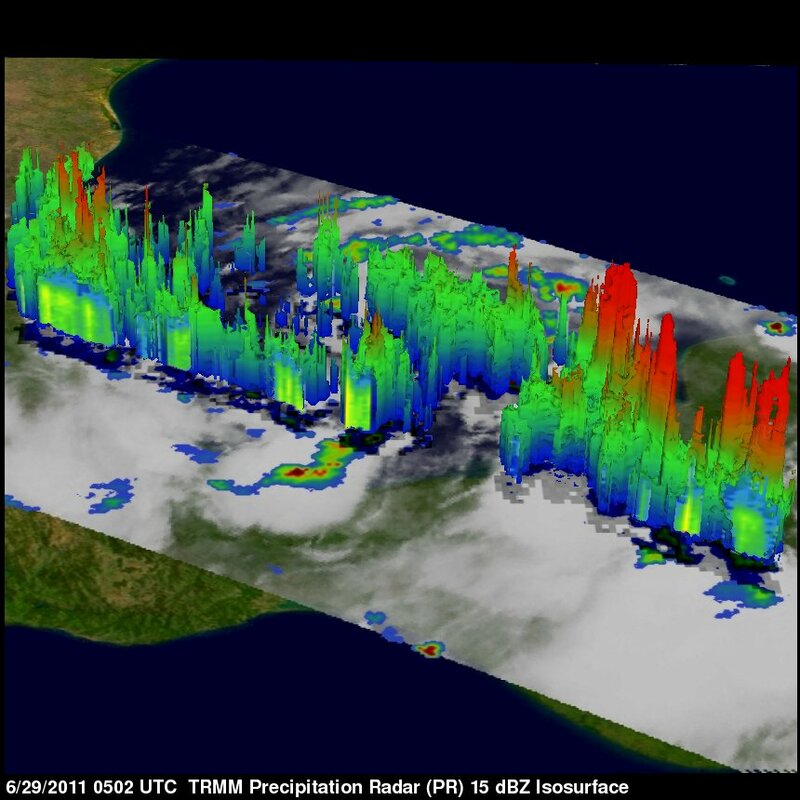 NASA's Aqua satellite measured cloud top temperatures giving clues about the strength of storms, while the TRMM satellite measured rainfall rates and cloud heights. All of this data is useful to forecasters in predicting Arlene's next moves. The Tropical Rainfall Measuring Mission (TRMM) satellite had a good look at Arlene when it passed above on June 29, 2011 at 0502 UTC (0:02 AM CDT). At that time Arlene's winds were estimated to be about 34 knots (~39 mph) indicating that it was barely a tropical storm. TRMM's Microwave Imager (TMI) and Precipitation Radar (PR) data showed that Arlene was getting better organized and contained scattered heavy thunderstorms dropping rain at a rate of over 50 mm/hr (~2 inches). Some of the heaviest rainfall was not near the center of Arlene's circulation but was in feeder bands over land along the southwestern Gulf of Mexico. A 3-D analysis of Arlene's vertical structure using TRMM PR revealed that very powerful thunderstorms in a feeder band over the southeastern Yucatan Peninsula reached to heights of 17 km (~10.6 miles). NASA's Aqua satellite passed over Tropical Storm Arlene on June 29, 2011 at 08:05 UTC (4:05 a.m. EDT). At that time, the Atmospheric Infrared Sounder (AIRS) instrument showed that most of Arlene's heaviest thunderstorms and coldest cloud top temperatures (-63F/-52C) were over the waters of the Gulf of Mexico. That data matched with the TRMM data that showed the heaviest rainfall was over open water. At 1 p.m. EDT on June 29, Arlene's maximum sustained winds had increased to 50 mph (85 kmh). It was located just 95 miles (155 km) east of Tuxpan, Mexico and 150 miles east-southeast of Tampico. That put Arlene's center near 21.1 North and 95.9 West. It was moving west near 8 mph (13 kmh) and had a minimum central pressure of 1000 millibars. A hurricane watch is in effect for the coast of eastern Mexico from Barra De Nautla Northward to La Cruz and a tropical storm watch extends farther along the coast. For updates, visit: www.nhc.noaa.gov. Residents in the area of the watches should prepare for gusty winds, heavy rainfall and rough surf. DHS's First Patent: A Citizen's Dosimeter! Is Our Education System Holding Us Back?